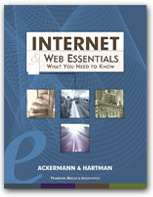 Like Ackermanns best-selling Learning to Use the World Wide Web and Internet Today!, co-authored by Karen Hartman, this latest effort covers the basic topics you need to know to master the ever-changing Internet. Furthermore, this book expands on vital topics such as searching and researching strategies and Web-page design issues that all students want to learn. With exercise examples shown for both Netscape Navigator and Internet Explorer browsers, this text can be used in any lab environment.